MONTE CARLO (Reuters) - Jamaican sprinter Usain Bolt, who became one of the world's most recognized athletes, and American women's 400 meters world champion Sanya Richards were named IAAF world athletes of the year on Sunday. Bolt, who won the award for the second year in a row, wiped out his 100 and 200 meters world records with stunning runs in the Berlin world championships in August. brilliant runner in both his specialties. "He brings a lot of prestige to our sport," Diack said. "He is one of the best-known people on the planet." Richards, who previously won in 2006, described the honor as being on the same level with her Berlin victory, her first global title. 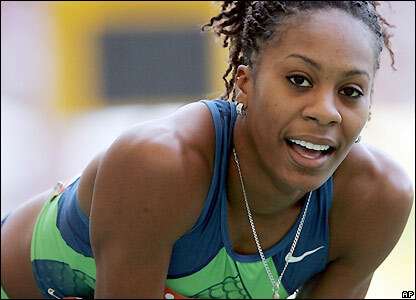 "I am going to be dancing all night," the 24-year-old Richards said ahead of the IAAF's annual gala. With no Olympic or world title at stake, Bolt said his biggest goal in 2010 would be to go undefeated on the new Diamond League circuit. The 23-year-old Jamaican is expected to face American world silver medalist Tyson Gay, the second-fastest 100 meters runner of all-time, at least three times with Jamaican compatriot Asafa Powell, the former world record holder, joining the pair in several races. "With three great athletes in one race, anything is possible," Bolt said. "I am going to be hard to beat if I am in shape," added the Olympic and world champion who did not lose a final in 2009. "But if I get beat, I would not be surprised." In the long term, Bolt said it would be important for him to defend his world and Olympic championships. "I don't consider myself a legend until I defend most of my titles," he said. Richards said Bolt was one of the reasons she finally won a global crown in the 400 meters. "I realized when I watched Usain Bolt compete and a lot of the other athletes that had great success...(that they) were having so much fun," Richards said. "I felt to myself I had to recapture that element of the sport that I had lost. "I was so focused on winning, the medals and the money and everything that came with being a champion that I forgot the simple enjoyment and fun of track and field," she said. Her goal now is to break her United States record of 48.70 seconds and one day approach Marita Koch's 1985 world record of 47.60 seconds. "That's the target," said Richards, who also has big plans off the track.